Anti-Bacterial, Anti Fungal & Mildew Resistant to help increase the life of the fabric. 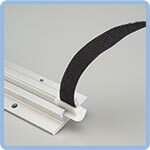 Can easily be cut to accommodate custom lengths on site, with no threads fraying. Tabs sealed every 10" along the top of each curtain. 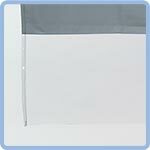 Durable vinyl-coated mesh screen curtain top (14") facilitates air flow. 16oz. Clear vinyl curtain base (13") to ensure safety & security. 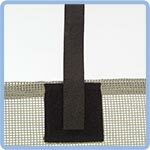 Privacy curtain middle is reinforced with a polyester scrim for greater rip stop. Curtains work with other hook & loop hung track systems. Curtains are made in the USA. Curtains may be customized to satisfy unique PREA requirements. ¾" x 6" hook tabs are fastened to Derby's molded slides, which give the curtain a smooth glide when opening. The curtain tabs can be adjusted to pull away easily from Derby's molded slides for increased security. 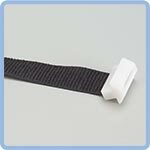 Releasable Curtain Tabs and molded slides are also sold separately for replacement. Slides and tabs made in the USA. 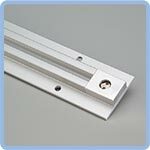 Heavy duty, custom designed anodized aluminum curtain track includes secure end stop and bit. Track can be pre-drilled for easy installation at no additional charge. Stainless security mounting hardware and security bits available for additional charge. Track system made in the USA.